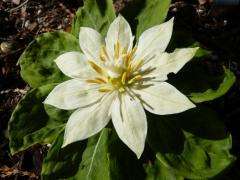 An ordinary-looking white flower from Japan may carry something quite extraordinary within its pale petals - the longest genome ever discovered. Researchers at London's Kew Gardens said Thursday they'd discovered that the Paris japonica has a genetic code 50 times longer than that of a human being. The length of that code easily beats its nearest competitor, a long-bodied muck dweller known as the marbled lungfish. "We were astounded really," said Ilia Leitch, of Kew's Jodrell Laboratory. Leitch and her colleagues suspected the plant might have an larger-than-usual genetic code as its relatives have rather large ones too. But the sheer size of this flower's genome caught them by surprise. If laid end-to-end it would stretch to more than 300 feet. "We certainly didn't expect to find it," she said. A genome is the full complement of an organism's DNA, complex molecules that direct the formation and function of all living organisms. The size of an organism's genome is typically measured by the number of bases it contains - base pairs being the building blocks of DNA. The human genome, for example, has about 3 billion bases and measures about 6 feet in length. The marbled lungfish has a whopping 130 billion bases. And the 12-inch (30-centimeter) flower studied by Leitch turns out to have 150 billion. "This is certainly an enormously large genome," said Nick Lane, a fellow at the Department of Genetics, Evolution and Environment at University College London. "I don't know of any larger genomes among plants or animals." Still, he cautioned that micro-organisms known as amoebas might have even longer codes, saying that the record "might not last long." Both Leitch and Lane said the find illustrates the staggering diversity of genome sizes. While Paris japonica and the marbled lungfish have huge ones, other genetic codes are minuscule - the parasite known as Encephalitozoon intestinalis, for example, carries approximately 2,300 bases. It's not always clear why the range varies so wildly. Bigger genomes don't necessarily mean a more complex organism. Whereas genes are generally supposed to correspond to some traits - blonde hair, for example, is genetically determined - in organisms with huge genomes, many genes don't appear to correspond to anything. "Effectively, some cells carry massive amounts of 'junk,' or at least non-coding DNA, whereas others have very little," Lane said. Leitch said that geneticists are still discussing the question of why some organisms carry masses of non-coding DNA, and that the study of organisms such as the Paris japonica can help add to the debate. "It's a question that's long intrigued scientists," she said. The results of her team's research are being published in the Botanical Journal of the Linnean Society. may be has to do with their age in the evolutionary chart where they evolved many more protective new functions which were switched on off depending on the environment!!?? Just remember that this so-called chart is a man-made construct that has very little to do with reality. A specie's placement on that chart does not necessarily determine it's true history, just man's speculation as to it's origins. Hence it would be as useless as saying that a map showing the I-94 determines the course of the road. This huge genome [and others like it] actually presents a big problem for Darwinian evolutionary thinking, which is why you read that the scientists are "surprised" or "astounded". This is normal soft-speak for things which do not conform to theory. Just look at all the latest surprises for the big-bang proponents. This tone-down use of "junk" tells the story of how they now realize that what was previously "junk" has some important functions in the cell. Remember that every organism alive today from the smallest single celled microorganism to us has been evolving for exactly the same amount of time. It always amazes me and makes me a bit dizzy to think that every cell alive in my body has literally been alive for close to 4 billion years, continually growing and dividing and splitting and merging, until it ended up as me! Wow! Some organisms just seem to have found it to their advantage to pare down and compact their genome and others to do the opposite (or at least not to their disadvantage). Who knows why? Genome sequencing and the consequent construction of phylogenetic trees gives you a pretty good idea where a species fits in and for larger taxonomic groups there is no doubt. It is just the absolute timing of splits that is in doubt, the relative times are well known. This huge genome [and others like it] actually presents a big problem for Darwinian evolutionary thinking, which is why you read that the scientists are "surprised" or "astounded". This is normal soft-speak for things which do not conform to theory. Care to tell us why this causes a problem? Just look at all the latest surprises for the big-bang proponents. You use a lot of words to say so very little. If you have an alternate hypothesis, present your evidence. Jumping up and down and saying "I don't understand it so it isn't true" doesn't cut it on a science forum. is it possible that genes concatenation happens more often than we think in nature? two species in one? just a thought. In general I think plants has to have more DNA because they build their organism just from unorganic atoms and sunlight, they need more enzimes and so on, and another thing here is that lots of domesticated plants are tri- and tetraploids(4 chromosomes from every kind not 2 as normal), and thats why are more productive. As the article mentions, the size of the genome does not correlate well with the complexity, or even adaptability of the organism. It's possibly the genome is inflated due to duplications or multiploidy, but this (generally) shouldn't give it an advantage. On the other hand, multiploidy could easily genetically isolate a population, so a new species would be created without much increase in fitness. Depends on what you mean by two species. Degenerate transposons would be likely candidates for increasing the genome size without creating any new genes. They would be remnants of a viral infection, so in a sense, there's a concatenation. Fusion of two multicellular organisms wouldn't be nearly as likely. "The human genome, for example, has about 3 million bases and measures about 6 feet in length. The marbled lungfish has a whopping 130 million bases. And the 12-inch (30-centimeter) flower studied by Leitch turns out to have 150 million." It should be billion base pairs, not million. Human genome has 3 billion base pairs, and this flower has 150 billion base pairs. Then please present your counter-hypothesis, along with evidence. God had some extra base pairs left over in the bin after he was finished creating everything, and decided to throw them all into this one flower for no particular reason. He seems like a pretty inefficient designer to me. Further, I'm with Skeptic - why exactly does this cause a problem? To me it seems that this finding supports evolution even more. It'd be far more compelling evidence for creation if every living thing had only the exact number of base pairs required for it to function in its current environment. Having millions of deactivated areas on the genome suggests previously evolved traits that are no longer necessary for the organism to survive, or perhaps evolutionary "dead ends" that never became useful. Hybrid polyploidy does happen, mostly in plants, but it's far more rare than gene duplications. In regards to transposons, those tend to go wild in cases where they degenerated. A great example is the alus, short stretches of transposons that compose a large part of the human genome, 10% in fact. Transposons like this continue to reinsert themselves into the genome, leading to a huge amount of junk DNA that may, at some point, develop into a coding sequence. So to verify whether the large genome of this plant is due to polyploidy or transposons/duplications, you could check how much of the sequence is coding. The problem with that is that it's 300 billion digits to go through to check for any clear sequences, and myriads of combinations of introns/exons that could tell you the number of coding genes. having some junk in the trunk can be usefull to fool invading viri and parasites that tamper with DNA, its like hiding the critical parts in a haystack, also I suspect that while the junk dna might nood code for enzmes, it keeps messenger RNA busy for timing/multi threading reasons,while reading the tape, so (guessing here) it might create an artificial wait loop so that an antagonistic enzyme B is not premature created before enzyme A, wich might take a little longer to assemble. God is by far the worst designer I've ever heard of. First, look at all of the problems his creations have. Second, good designers seek to improve their designs. God's design is supposedly perfect, so we're still stuck with his retarded ideas about what makes a good body. Amirite Kevin? If god directly created different species separately out of thin air, then he is indeed a retarded designer. Any human geneticist could do better, and hundreds of billions spend on healthcare is evidence of his incompetence. On the other hand, if god established a few basic physical laws in the first instant of the universe, and then let the creation create itself, that would be a feat much more worth of god than this childish concept of creationists man-like god personaly building everything. someone beat me to the punch, but if we only understand 5% of the function of the human genome, that doesn't mean any of the remaining 95% is junk. Same thing applies to this flower, I don't buy the "junk" argument and I beg to question how scientific is this label? ShotmanMaslow - exactly, and well said! The 'creationists' are an insult to a true god. But creating a flash of light and a set of simple rules that lead to self-improving designs creating themselves is FAR more impressive. Anything less isn't worthy of a god. Whether god (or gods) exists depends on what you mean by 'god'. Scientists usually use a three syllable word (universe or multiverse depending on how well they understand QM), but 'god' is a fine three-letter version. Both sides should realize the 'universe' and 'god' are the same, and the time period that young-earthers translate as a 'day' is an 'era', and that evolution is intelligent design (far more so than hand-crafting everything). Then the debate becomes philosophy - is there a purpose behind existence?, which is (so far, at least) beyond the realm of science. Fairly scientific. Junk DNA does serve some purposes: it helps in the regulation of gene expression, serves as a vast site for random walks for new genes to evolve, and as Djincs noted, it can also serve to stop viral DNA from being expressed when it is inserted. The term junk, though, is used for non-coding DNA, that is, none of those 95% actually code for proteins, although large segments are highly stable since they serve some kind of genomic purpose. Probably infected with a virus in the past that left a lot of genetic remnants that cause little or no ill effects. The incredibly complex genome of the given parasite makes on think, or consider -that maybe the instructional or behavioral programming is in the genome, as opposed to elsewhere. Ie, it undergoes genetic change due to specific conditionals, as a response to environment, or what have you. As a potential thought, this complex parasite may be a different expression of another parasite that, at this time, may be considered to be 'different' enough to be granted another name. Who knows. Not out of the realm of possibility, merely out of the realm of experience or recognition. Reaching new points of understanding does involve new thoughts, however radical they may initially seem. One of the largest genomes belongs to a very small creature, Amoeba dubia. This protozoan genome has 670 billion units of DNA, or base pairs. The genome of a cousin, Amoeba proteus, has a mere 290 billion base pairs, making it 100 times larger than the human genome. "A University of California-San Diego scientist says genetic material derisively called "junk" DNA is important to an organism's evolutionary survival." So... the upshot is size doesn't matter? Science, you so crazy. As a software engineer, it makes perfect sense to me that size not only doesn't matter, but that most of the DNA doesn't code for proteins. If I think of proteins as the structure, and the rest of the DNA as the complex parts that control how and when that structure if formed and used, then really, evolution is mostly about the non-protein coding sections. In this case, I would expect simpler organisms to often have much longer genomes, because they have not yet evolved the complex control structures prevalent in higher organisms. One an organism has developed the ability to have multiple layers of control in a smaller section, then the size of genome can shrink.